We're approaching the end of 2014 and it's a good time to review what's worked and what hasn't worked this year. If I think back to my competition angling, one rod stands head and shoulders above the rest as my best performing lure rod - the Major Craft Turel TUS-T762. As highlighted previously, the Major Craft Turel unexpectedly came into my possession in September 2013 after winning it in a lure fishing competition. Obviously, I was pleased. I knew and respected Major Craft's rods. Dan had a Solpara right back when we started experimenting with LRF. And out the bag it looked great. Would I have bought this rod? No. I remember I was definitely a solid-tip fanboy at the time. I was predominantly fishing LRF and the majority of time I was fishing up-and-down around structure. Solid-tips suited me best. My confidence was built around solid-tips and consequently I used them for most of my light lure fishing. I started using the tubular-tipped Turel on my local stretch of the Kennet and Avon chasing Perch. I'll be honest, I didn't like it. Moving from a steely European rod to a Japanese model really freaked me out. Initially it felt like fishing a rubber band and I'd lost some of the feel. My relationship with the rod was on and off. I periodically persisted because I knew how advanced the Japanese were and I felt it was me that was broke. I held on to the principal that softer rods landed more fish. I think I still stand by that today - especially when using braid. Although the principal was sound, with limited time to fish I tended to stick to my comfortable rods so I could enjoy each trip to the max. Then a few events happened, namely I wore out my trusted Garbolino and my HR UL was waiting for repair, so it kind of forced my hand. 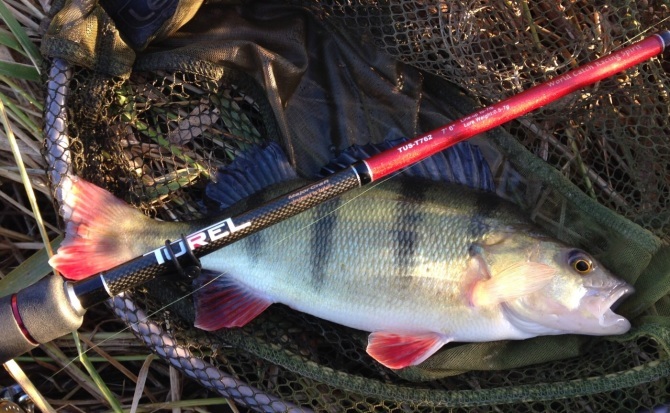 The British Lure Angling Champs were announced and I began to practice using the Turel. I think I highlighted before how much prep I put into practice, clocking up a few hundred Perch. Some way along that practicing I changed the way I fished, including how I used a fishing rod. To the point that my grip changed on the rod. I swear it was an entirely subconscious change, as I focused on catching more fish. It freaked me out when I noticed. I fished that rod entirely through the BLAC qualifiers. I only switched over in the final (which in hindsight may have been the wrong thing to do). I also switched the rod and the style back over to my saltwater fishing where it also had a marked effect. The Turel has already helped me earn 5 podium positions this year across mixed disciplines. Perhaps the highest accolade. Is the rod perfect? No. I've learned a lot this year. The calmer conditions experienced inland on the canal have meant I've been able to scale down and fish even lighter than before. For the first time I appreciate the benefits of SiC guides. The Turel has quality Fuji Alconite rings and while they've shown no sign of wear, casting accuracy is noticeably improved when I've switched over to rods with SiCs. I'd probably change the handle too. The fore-grip is a little too long for me. I like to lay my index finger along the blank. It's probably this design that lead to my grip changing this year. Am I bothered? Obviously not. I will always be fond of this rod and what it helped me to understand about rod design - good and bad. All from a rod priced at under a hundred quid. No items matching the keyword phrase "major craft turel l" were found. This could be due to the keyword phrase used, or could mean your server is unable to communicate with Ebays RSS2 Server.